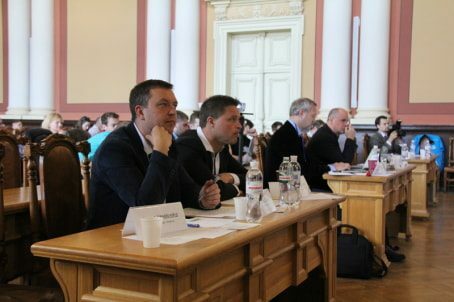 On May 20th, students from leading Ukrainian technical universities gathered at the finals of the innovation projects contest IT-Eureka in Lviv, where 10 out of 207 teams competed for the name of the most innovative student project 2016. For the second year in a row Sigma was a general partner of the event and from now on will become its main driver and organizer in Ukraine. The IT-Eureka! Ukraine contest aims to develop entrepreneurship and innovation among IT students. The competition is supported by the Ministry of Education and Science of Ukraine, leading tech universities and businesses, and is a part of the TEMPUS project NEFESIE (National Education Framework for Enhancing IT Students’ Innovation and Entrepreneurship). Sigma was a partner of the contest and TEMPUS project from the very beginning, when the program got support and financing from the European Commission back in 2012. The goal of NEFESIE is to strengthen cooperation between educational institutions, research institutes, and business in Ukraine. Among the project partners are Sigma, IKEA, the Ministry of Education and Science of Ukraine, Linnaeus University (Sweden), Dublin City University (Ireland), Oxford Brookes University (UK), Pedro Nunes Institute (Portugal), and five Ukrainian universities. IT-Eureka competition, which was first introduced in 2015 and then continued in 2016, proves that the TEMPUS program has created a positive impact. Over 600 innovative projects and 1500 students participated in the competition in 2015 and 2016. The winners of this year are Cut and Dry project by the students of Petro Mohyla Black Sea State University (1st place), CCLIPSE project from Vinnytsia National Technical University (2nd place), and Taryfikator project from Lviv Polytechnic National University. The champion team members presented their idea of a tablet computer for people with special needs. This device is assumed to display images as relief objects. It would also be able to recognize voice, perform voice search, store a large number of images, and convert pictures from Internet. CCLIPSE is a concept of a software and hardware complex designed for people with cardiovascular diseases and patients bedridden due to spinal injuries, stroke, heart attacks, and more. With the help of microchips, a patient’s cardiovascular system is supposed to be continuously monitored. The complex would be able to count the number of heartbeats, the level of the oxygen in blood, body temperature, etc. The 3rd winner is the Tarifikator team. The students have developed a mobile app that helps users choose the most convenient mobile subscription package. The system analyses user’s calls (incoming and outgoing), determines Internet traffic volumes, compares the subscription packages from different mobile operators, and gives recommendations on the most cost-effective rates for the user. By tradition, Sigma provided the winners with an opportunity to attend the biggest Ukrainian innovation conference IT-Arena 2016 and present their daring ideas at the Startup Alley.